Choosing the right home theater speaker system can be a real headache. There is a lot of things you have to consider – your budget, the best speaker layout for your room, characteristics of each speaker. You also have to know some basic things about different types of speakers (bookshelf speakers, floor standing speakers, satellite speakers, height speakers, in-wall speakers, etc.). It can be a really tricky business but don’t worry. Our article on 27 best home theater speakers is designed to help you understand all the important things about home theater speakers and help you make the final decision. In this article, we are going to talk about different parts of a home theater system, different speaker layouts, advantages of different layouts, types of speakers and their roles. Also, we are going to present to you our selection of the best home theater speakers and speaker systems. In the end, we are going to give you a short tutorial on how to buy home theater speakers and explain the most important technical specifications you should pay attention to when buying home theater speakers. Video and audio sources – Blu-ray/DVD Player, gaming console, satellite/cable box, etc. We assume that you already have a TV, some video or audio sources that you want to connect, and some AV receiver and that you only need the right set of speakers and that’s what this article is about. 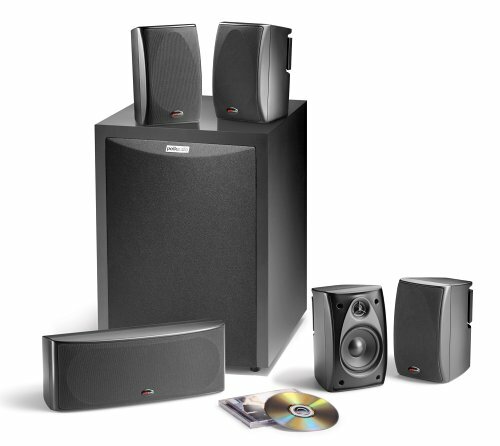 A home theater (surround sound) speaker system consists of at least 6 speakers – Center, Front Left, Front Right, Surround Left, Surround Right, and a Subwoofer. 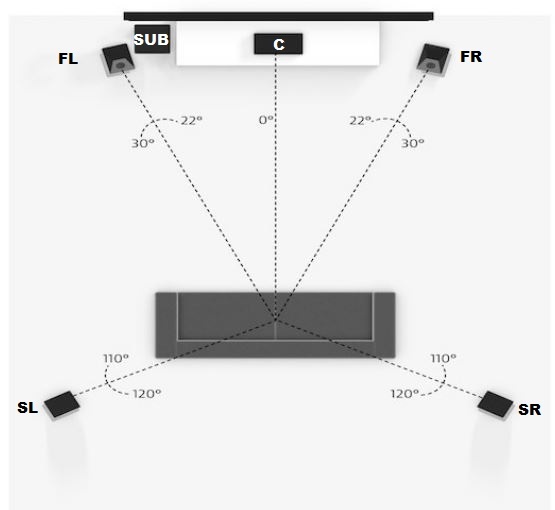 Bigger speaker sets may include additional surround speakers (Surround Rear Left and Right), additional subwoofer, as well as height speakers (in-ceiling and elevation speakers). You can buy a home theater in a box (or HTiB). This is a bundle that contains a set of speakers (usually 5.1) and a receiver that matches the speakers. In case you already have a receiver, you can buy just a set of speakers. This is a really convenient option. You will get all the speakers you need inside one package and you won’t have to worry if they are going to sound good together. They will also look good together since they all have the same design. You will find 12 different packages on our list 27 best home theater speakers (10 wired and 2 wireless). You can buy each speaker separately and combine them into a system. This option is the hardest one. You will have to pay attention to different technical specifications, match the speakers with your receiver, and try to make an aesthetically pleasing combination. Finding and matching different speakers can be a really difficult task and you shouldn’t be doing this unless you have a good understanding of audio equipment. Still, this is a viable option if you don’t have enough money for the whole system at the moment but you want to improve the sound of your TV. If that’s the case, you can always buy a pair of speakers (bookshelf or floor standing speakers, for example) that you can use as Front Left and Front Right and then make further upgrades when the opportunity arises. Some people like to start with some basic 5.1 surround sound speaker system and then make upgrades to 7.1, 5.2 or 7.2, even 9.2. or 5.1.4. You will find 15 individual speakers divided into categories (by type) on our list of 27 best home theater speakers. We have also tried to analyze each speaker from each of those 12 home theater speaker systems individually and give you the most important technical specs for those speakers. Soundbars have become very popular during the last decade. It’s the most elegant way to improve the sound of your TV – it’s hustle free solution, it doesn’t always require AV receiver, and it saves space thanks to its slim design. It’s very easy to install and that’s another advantage of soundbars. After the introduction of a soundbar, the first home theater speaker systems with a soundbar appeared. These systems consisted of a soundbar that usually replaces all three front speakers (Center, Front Left, and Front Right), a subwoofer, and two or more surround speakers. Most of the home theater speaker systems with a soundbar don’t require AV receiver. Soundbars are, in fact, the central units – all the speakers (subwoofer, surrounds, rears) as well as all the input devices are connected to the soundbar. Some soundbars can even simulate surround sound on their own, without additional speakers but having a subwoofer and surround speakers is definitely a much better option. The latest big thing in the world of home theater systems are wireless home theater speaker systems. They are very popular mostly because of the convenience they bring to our lives. They can’t really compete with wired systems but they are getting better. There are only a few good options when it comes to wireless home theater speakers and speaker systems and we have included some of those on our list. You should know that there is no decent truly wireless home theater speaker system. Most of those good wireless systems (like SONOS or Enclave 5.1) have to be plugged in (they are not truly wireless) but you won’t have to wire the system (all the speakers will communicate with the main unit wirelessly). Some wireless speaker systems use Bluetooth, other use your home Wi-Fi network, and there are also some systems that use their own wireless network generated by the main unit. In general, Wi-Fi systems and systems that use their own wireless network offer much better performance than Bluetooth systems. Now that you know some basic things about home theater speaker systems, you may want to take a look at our list of 27 best home theater speakers. 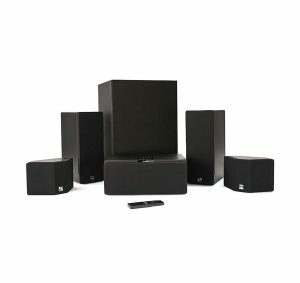 The list is divided into three sections – Best Wired Home Theater Speaker Systems, Best Wireless Home Theater Speaker Systems, and Best Home Theater Speakers by Type (you can find here best subwoofers, best center speakers, best bookshelf and floor standing speakers, best surround speakers, and best height speakers). This is our list of 27 best home theater speakers in 2019. 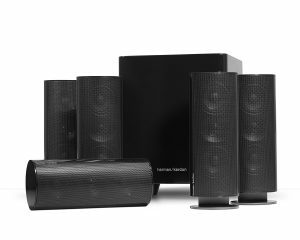 This is one of the most popular Yamaha’s home theater speaker packages. It’s one of the cheapest on the market, it offers very good value for money and it is one of the best choices if you are on a budget. NS-SP1800BL speaker package comes in a 34-pound box. The package is simple – Yamaha decided not to spend too much money on the presentation. Inside that large box, you will find two smaller ones – one with subwoofer and the other with all the speakers (C, FL, FR, SL, and SR). Along with the speakers, you will get a user manual, specification sheet, one RCA audio cable for connecting the subwoofer to the receiver (you should use pre-out subwoofer port on your receiver), a speaker wire.4 non-skid pads, and 1-year warranty card. The subwoofer weighs almost 19 pounds, it’s 11.4 inches wide, 11.4 inches high, and 12.9 inches deep. Center speaker weighs 2.6 pounds, it’s 11.8 inches wide, 4 inches deep and 4 inches high. Front and surround speakers are identic satellite speakers (Yamaha NS-AP2600S). Each satellite weighs 1.6 pounds, it’s 4 inches wide, 6.4 inches high, and 4 inches deep. This is a small entry-level speaker package designed for smaller rooms. It looks nice and minimalistic, nothing shiny or premium. Build quality is not perfect, everything is made of hard plastic but it’s good for the price (many expensive speaker systems are also made of plastic). Installation process could not be simpler. Connecting all the speakers shouldn’t take more than 10 minutes but hiding all the cables will take much more (unless your room is prewired). All the speakers (except the subwoofer) can be wall-mounted. The sub has one front-firing 8-inch driver. It’s active (powered) and you are going to need a receiver with SUB pre-out port. It can handle 50W continuously (RMS), while its peak (dynamic) power is rated at 100W. Its impedance is 5Ω and frequency response spans from 28Hz to 200Hz but to be honest sub-bass reproduction is not impressive (the range is more like 45Hz -200Hz). The center speaker (NS-AP2600C) features three drivers – one ½-inch tweeter and two 2.5-inch woofers. Speaker’s RMS power input is rated at 30W (100W peak power), and impedance is 6Ω, sensitivity is 85dB (not impressive). There is no info on the frequency response of the center speaker. Each satellite features two drivers – one 2.5-inch woofer and one ½-inch tweeter. Their RMS input power is 30W (100W Peak Power), their impedance is 6Ω, and their sensitivity is 82dB (that’s maybe fine for the surround speakers but not good enough for the front left and right speakers). The frequency response of all the speakers combined spans from 28Hz – 50KHz but we can’t help but notice that not all the frequencies are reproduced equally well. The sound quality is very good for the price. You can’t really expect it to be perfect and there are some flaws (you can read about them in the next section) but we are happy with the sound. Mids and highs are clean and detailed, center channel does a great job with dialogues and mid frequencies, and surrounds put you in the center of the action. The subwoofer and front speakers could be better. This speaker package is great for movies and TV watching but not so great for music. The subwoofer is the weakest link. The sound gets distorted at high volumes and it sometimes overpowers other speakers. Also, it’s not great with sub-bass frequencies and you won’t be able to really feel the bass. After all, this is a small 8-inch subwoofer and you can’t expect it to produce incredibly deep bass. You can always make an upgrade from 8-inch to 10 or 12-inch sub and that’s something you should think about. Speaker wire that comes with the NS-1800BL speaker package is cheap and you should probably buy better (16 or 18-gauge) wire. 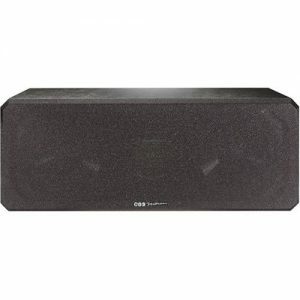 Energy 5.1 Take Classic is another very popular home theater speaker system. You can buy it for less than $300 and for that kind of money it delivers very good sound and really immersive surround sound experience. It definitely has its flaws (especially when it comes to bass response) but you can’t expect it to be perfect in every aspect for that kind of money. The speakers (SUB, 4 satellites, and center channel) come in a large 40-pound box. Along with the speakers, you will get a user manual and a warranty card. Speaker wire and banana plugs (you are going to need 5 pairs) are not included and you have to purchase them separately. The subwoofer weighs almost 20 pounds, it’s 12.6 inches high (14.8 inches including feet), 12.6 inches deep, and 12.6 inches wide. Each satellite speaker weighs 2.9 pounds. They are 6.9 inches high, 4.2 inches wide, and 4.2 inches deep. Center speaker weighs 3.2 pounds, it’s 10.3 inches wide, 4.2 inches high, and 4.2 inches deep. Energy 5.1 Take Classic speaker system is slightly larger than Yamaha’s NS-SP1800BL but it is still not the perfect choice for large rooms. It’s a great choice for small rooms and it will sound good in mid-sized rooms. The speaker system is available in one color (black with glossy finish). The sub is shaped like a cube and all the other speakers are cuboids with sharp edges. They all look really nice together. All the satellites and the center speaker have removable cloth grille that protects the drivers. The speaker enclosures are made of MDF (which is better than plastic but not as great as real wood). All the speakers are very well built, they look really sturdy and durable. Installing the system isn’t too complicated. All those ports on the rear panel of the subwoofer can be confusing but you don’t really need them all. If you have a receiver with subwoofer pre-out ports, you can use only one RCA port at the bottom of the rear panel (on the subwoofer) and connect it to the sub pre-out port on your receiver. The rest of the installation process is pretty much standard. All the speakers can be wall-mounted. The subwoofer has one down-firing 8-inch driver made of molded polypropylene and one bass reflex port on the front side. Its dynamic power output is 200W (this is peak power), and frequency response spans from 33Hz to 150Hz. On the rear panel, you will find 2 knobs – volume and a low-pass filter (you can set the range of frequencies that’s going to be produced by the subwoofers). There is also a phase switch on the rear panel (you have to use it if you have two subwoofers working together). The satellites feature one 0.75-inch aluminum tweeters and 3-inch poly-titanium woofers, just like the center channel. They all have peak power input rated at 100W and you can use any amplifier/receiver that can output 20W-100W of power (per channel, at 8Ω load) to drive al these speakers. All the satellites, as well as the center speaker, have 89dB sensitivity. The frequency response of the satellites spans from 115Hz-20KHz and frequency response of the center speaker spans from 110Hz-20KHz. Energy 5.1 Take Classic really excels in the sound quality department. Bass is punchy but not too strong or overpowering, mids are clear and articulate, highs sound very detailed and rich. The system is not too loud and that’s one of the reasons why it’s not a good choice for larger rooms. On the positive side, there is practically no noticeable distortion (even at high volumes). We can’t really complain too much about the sound. For its size and for the price, this is an excellent speaker system. You just have to be aware that 8-inch subwoofer cannot shake your floor. If that’s what you want, buy a bigger subwoofer. All the speakers have a glossy finish and some people might not like that because it’s a fingertip magnet. Speaker wire, mounting kit, and banana plugs are not included in the package. Onkyo SKS-HT993THX 7.1 speaker system is one of the best mid-end home theater speaker systems on this list. It can’t be considered affordable since the price varies from $700 to $1.100. You will have to spend a significant amount of money on this speaker system but if you have a mid-sized or a large room, this speaker system could be the best choice. These speakers can fill any room with immersive sound. SKS-HT993THX comes in an enormous 112-pound box. Everything is well-packed and protected and each piece of equipment is quite heavy. You can practically feel the quality even before you connect everything and actually hear the speakers. Inside the box, you will find 8 speakers – 1 subwoofer (SKW-980), two front speakers (SKF-980), one center speaker (SKC-980), four satellites (2xSKR-980 and 2xSKB-980), user manual, a set of color-coded speaker cables (11ft long red and white cables for front speakers, 10ft long green cable for center speaker, 4 x 26ft long satellite cables, and 10ft long subwoofer RCA cable), and a warranty card. The mounting kit is not included. The subwoofer weighs 34.2 pounds, it’s 15 inches wide, 17.5 inches high, and 17 inches deep. Each front speaker weighs 11.7 pounds. They are 6.2 inches wide, 17 inches high, and 7.8 inches deep. Center speaker weighs 11.7 pounds, it’s 17 inches wide, 6.2 inches high, and 7.8 inches deep. Each satellite speaker (surrounds and rears) weighs 7.7 pounds. They are 7.9 inches wide, 10.8 inches high, and 6.7 inches deep. The speakers look really nice. They are all black with some glossy coating but they are not too shiny. There is protective cloth grille on the front side of each speaker. Speakers are made of MDF (it stands for Medium Density Fiberboard and it’s actually engineered wood). They look firm and very strong and leave the impression that they are made to last. Connecting everything is really simple and you just have to follow the instructions from the user manual. As always, you will spend more time on hiding the wires, positioning the speakers, or mounting the speakers than on the connecting the speakers to the receiver. The subwoofer is powered and you need a SUB pre-out port on your receiver to connect it. All the speakers, including the subwoofer, have sealed enclosures. The subwoofer features one 12-inch front-firing driver with a power output rated at 125W and with a frequency response that spans from 20Hz to 100Hz. Front speakers, as well as the center speaker, feature two 2 5-inch woofers and one 1-inch tweeter. Each satellite has one 5.2-inch woofer and one 1-inch tweeter. All the speakers (FL, FR, C, SL, SR, SRL, SRR) have 8Ω impedance and extended frequency response – 50Hz to 45KHz. Each speaker can handle maximum power input of 130W (that’s the peak power input and there is no RMS power rating in the specs list). Front speakers and center speaker have 83 dB sensitivity (they are not incredibly loud) and all the satellites have 81 dB sensitivity. The speaker system is THX certified which means that it complies with the highest audio industry standards in terms of audio quality, performance, and integration with other audio equipment. These speakers sound really good and deliver an incredibly immersive listening experience. Bass is punchy but not overwhelming, mids and voices are clear and articulate, highs are rich and super-clean. The balance between lows, mids, and highs is almost perfect. The bass is accurate and punchy, but we’ve expected it to be slightly stronger. We can’t really say that this is an affordable speaker system but you really get high-quality for your money and if your budget is big enough, you should definitely buy it. You won’t regret it. Polk is a well-known car and home audio equipment manufacturer and their products usually offer great value for money. The first Polk home theater speaker package we are going to review is RM6750 5.1 speaker system. This one is not our first choice since Energy 5.1 speaker system costs less and offers nicer sound but this one is not far behind and it deserves our recommendation. RM6750 5.1 speaker system comes in a large 52-pound box. Inside the box, you will find six speakers (one subwoofer, 4 satellites (RM6751), and one center speaker(RM6752)), a set of rubber feet, a user manual, wall-mounting templates (for the satellites and for the center speaker), and a warranty card (3-year warranty for the subwoofer, and 5-year warranty for speakers). Wall mounting kit and speaker wires are not included and you will have to buy them separately. The subwoofer is 15.9 inches high, 11 inches wide, and 13.5 inches deep. Each satellite speaker is 6.5 inches high, 4.1 inches wide, and 5 inches deep. Center speaker is 4.3 inches high, 11.2 inches wide, and 5.2 inches deep. The system looks really nice. It comes in black color only and it’s not too big. This speaker system is a good choice for smaller (maybe even mid-sized) rooms. All the speakers are made of plastic, and to be honest, they don’t really look durable (especially the satellites). The plastic seems thin. They are easy to install, and you will find all the instructions in the manual (connecting the subwoofer to the receiver can be tricky but if you follow the instruction, everything is going to be fine). The center speaker, as well as satellites, can be mounted on walls. You will get mounting templates but you will have to buy all the brackets, screws, and all the other mounting equipment separately. All the speakers have vented enclosures for improved low-end reproduction. All the satellite speakers, as well as the center speaker, have ports on the back side and the subwoofer has a direct radiating bass port. The subwoofer features one front-firing 8-inch driver (without magnetic shielding). This is a powered subwoofer. The subwoofer’s built-in amp has dynamic power output rated at 100W (50W continuous power at 4Ω load). Frequency response spans from 40Hz to 200Hz. The subwoofer has a low-pass filter, volume knob, as well as phase switch (0° or 180°) and power switch. There are also 2 RCA inputs (LINE IN) and speaker level inputs and outputs (for left and right speakers). Center, front, and surround speakers have 8Ω impedance, 89dB sensitivity, and their peak power input is rated at 100W (50W RMS power). You can use any amplifier/receiver that has 20W-100W rated power output per channel. All the speakers have magnetic shielding. The center speaker features two 3.5-inch woofers and 0.75-inch tweeter. It’s frequency response spans from 100Hz to 24KHz. All the satellites feature one 3.5-inch woofer and one 0.75-inch tweeter and have the same frequency response as the center channel. The frequency response of this system spans from 40Hz to 24KHz. Polk RM6750 5.1 speaker system sounds pretty good. The sound is clean and loud enough for smaller or mid-sized rooms. We haven’t noticed distortion at high volumes. The bass is not crazy deep but it definitely brings action scenes to life. Dialogues sound clear and intelligible, surround speakers reproduce high frequencies well but we think that front speakers need to be improved. Their low-end reproduction is quite poor. They are ok for movie or TV watching, but not great for music. The subwoofer is not useless but it doesn’t offer wall-shaking bass. If that’s something you want, you will have to buy a bigger subwoofer. The system is good for movies but not great for music. You already know that we don’t really like those front speakers (FL and FR satellites) but there is another issue – the subwoofer doesn’t sound great when some bass-heavy music is being played and there is some rattling sound at maximum volume. The next speaker system on our list is Leviton’s AEH50-WH Architectural Edition Home Theater Speaker System. Leviton made it in cooperation with JBL and that’s what recommended this system. It’s an entry-level low-cost package so you shouldn’t expect anything extraordinary but it’s good enough for small rooms. Inside 40-pound box, you will find 6 speakers (one subwoofer and 5 identical satellites), 5 mounting brackets for satellite speakers, one RCA cable for connecting the subwoofer to the receiver (if your receiver supports Dolby Digital and DTS surround sound and most of today’s receivers feature support for DD and DTS surround sound), user manual, and warranty card. Speaker wire and banana plugs are not included and you have to buy them separately. The subwoofer weighs 28 pounds, it’s 16.25 inches high, 11 inches wide, and 13.75 inches deep. Each satellite speaker weighs 1.8 pounds. They are 5 inches high, 3.5 inches wide, and 3.5 inches deep. This speaker system is probably one of the best-looking systems on the market. You can really see the JBL’s influence on the design. JBL pays attention to details and to the presentation and Leviton AEH-50 WH is the perfect example. If you really need something beautiful and affordable for your new entertainment center, this might be the best option. There are other affordable and even better options (in terms of sound quality) but none of them look as nice as Leviton AEH-50 WH. This speaker system comes in 2 colors –all-black and all-white. The installation is simple but if you want to mount all the speakers on walls, it will take some time. You will get all the mounting gear but don’t forget to buy speaker wire and banana plugs (for the satellite speakers). You can find all the installation instructions with pictures in the user manual and if you follow every step, there should be no problems. There are two great things about this system. The first one is that it is expandable – you can buy additional satellites and make an upgrade from 5.1 to 7.1 (or 9.1). Unfortunately, you can’t buy an additional subwoofer. The other thing is that every satellite speaker is wall-mountable. The subwoofer features one 8-inch down-firing driver with a bass reflex port on the front panel. The sub is powered and has a built-in amplifier. Amplifiers dynamic power output is rated at 100W. Subwoofers frequency response spans from 35H to 160Hz. Each satellite speaker features 2 drivers – one 2.5-inch woofer and one 0.5-inch tweeter. Their impedance is 8Ω, sensitivity is 86dB, and frequency response spans from 150Hz to 20kHz. There is no info on maximum/RMS power input in the specification sheet but you should know that Leviton recommends using amplifier/receiver with 10W-100W power output per channel. Leviton AEH50-WH delivers good sound for the price but nothing more than that. You won’t be amazed by the sound, that’s for sure. The bass is there but it sounds a bit thin. Mids and highs sound accurate but vocals and dialogues are not perfectly clear – those low-frequency mail voices sound a bit muffled (especially at high volumes). These tiny speakers can’t really reproduce low frequencies well but thanks to the subwoofer you won’t notice the lack of bass until you hear the dialogues. It’s like there is some gap in frequency response (somewhere in between upper bass and lower mid-range). This speaker system will be able to fill a smaller room with sound but it’s not the best choice for large (or even mid-sized) room. The subwoofer delivers accurate and punchy bass but it’s not mind-blowing. After all, this is only an 8-inch subwoofer. There is one much bigger issue. Those small satellite speakers are a perfect choice for surround and rear speakers but they are not the best choice for the center and front speakers (FL and FR). Those speakers should have a much better low-end reproduction. Because of these small speakers, some male voice won’t be perfectly clear and music won’t sound great. Leviton AEH50-WH performs better when used for movies. 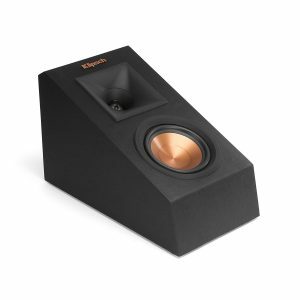 Klipsch is one of the most popular brands when it comes to home audio equipment (bookshelf speakers, floor standing speakers, subwoofers, satellites, home theater speaker systems). This is one of the cheaper home theater speaker systems made by Klipsch and it’s one of the best mid-range systems on the market. If you need a relatively affordable speaker system for a small or mid-sized room, Klipsch’s HDT-600 is one of the best options. HDT-600 comes in a large Klipsch-branded 40-pound box. You will get a set of 6 speakers (one subwoofer, one center channel, and 4 satellite speakers), wall brackets in case you want to mount the speakers on walls, inserts for floor stands, user manual, and 5-year warranty card. You won’t get speaker wires and RCA cable (for connecting the sub to your receiver) and you should buy them separately. The subwoofer is 13.9 inches high, 12.5 inches wide, and 12.5 inches deep. The center speaker is 3.6 inches high, 9 inches wide, and 3.85 inches deep. Satellite speakers are 6 inches high, 3.6 inches wide, and 3.8 inches deep. The speaker package looks really nice. It’s all black. The subwoofer is cube-shaped and has a matte finish while the satellites are oval and have that glossy finish. All the speakers have cloth grilles protecting the drivers. Grilles are removable. The subwoofer’s cabinet is made of MDF and all the satellites are made of hard plastic. We would prefer MDF cabinets for satellite speakers but what can you do – all the manufacturers are trying to cut costs and using plastic instead of more quality materials is the most efficient solution. Still, this speaker system looks like it’s made to last. After all, Klipsch doesn’t offer 5-year warranty without a reason. Connecting and installing the system is fairly simple. Speaker wires and RCA cable are not included so be sure to buy them before you start the installation. Wiring the system is a breeze, there is nothing that could possibly confuse you and the instructions are easy to understand and follow. The subwoofer features 8-inch down-firing driver with a bass reflex port on the rear panel. The sub is powered (has a built-in amplifier). Amplifier’s power output is rated at 100W (dynamic power). Sub’s frequency response spans from 36Hz to 200Hz. The center speaker features two 2.5-inch mid-bass drivers and one 0.75-inch tweeter. Each satellite speaker features one 2.5-inch mid-bass driver and 0.75-inch tweeter. All these speakers have the same frequency response (150Hz to 20kHz) and their impedance is 8Ω. You can use any receiver with up to 100W output power per channel to drive the speakers. HDT-600 sounds very good for its size. The mids and highs are crisp and detailed (especially highs). The subwoofer is small but it puts some punch and it can really bring all those action scenes to life. The center speaker struggles with deep male voices – they sound kind of thin but they are still understandable. Also, we don’t think that HDT-600 is the best choice for listening to music. Bass response of the front speakers is simply not good enough and they can’t reproduce really low frequencies. This speaker system is a great choice for smaller rooms and it can even fill mid-sized rooms with nice and lifelike sound. We have noticed that the sound coming from the subwoofer distorts just a little bit at maximum volume, so you shouldn’t crank this little guy that much. Even at 60-70% volume, it will deliver a strong punch. It’s not going to shake the floor but it’s really good for its size. There is also one technical detail – in case you want to mount satellites on floor stands, you should know that speakers have mounting holes on the side and stands usually have holes along the vertical bar which makes them incompatible. The next speaker system on this list is a bit pricey mid-end system. It’s Definitive Technology ProCinema 600. It costs more than other mid-end systems but it actually offers better performance than others. Are they overpriced? Probably. But if you have enough money and a matching room (small or mid-sized) this could be a perfect choice. The speakers come in a 36-pound cardboard box with package content listed on the box. You will get a set of six speakers (one subwoofer with a detachable power cord, one center channel, and 4 satellites), user manual, and a warranty card (you will get 5-year warranty for the drivers and enclosures, and 3-year warranty for other parts). The package does not include speaker wire, mounting kit (wall brackets, screws), banana plugs (for the center speaker and satellites) and RCA cable for hooking up the subwoofer to the receiver. The subwoofer is 10.4 inches wide, 13 inches high, and 13 inches deep. The center speaker is 10.5 inches wide, 4.25 inches deep, and 4 inches wide. Satellites are 7 inches high, 4 inches wide, and 4.25 inches deep. The system looks really stylish and elegant. Satellites and center speaker have that glossy coating that makes them even more attractive (especially if you are into shiny stuff). Unlike the rest of the speakers, the subwoofer is an ordinary cube made of MDF with a matte finish. Each speaker has a cloth grille on the front side. You can remove it easily if you prefer the look without the grille. The speakers come in two colors – black and white. All the speakers are wall-mountable (one screw for satellites, two for the center speaker) but mounting gear is not included, so if you want to mount it, you have to buy all the necessary equipment separately. You will also have to buy a speaker wire and banana plugs. Once you get all the equipment you need for the installation, you can start wiring the system. Connecting everything to the receiver is a pretty much standard procedure. We recommend using RCA cable for hooking up the subwoofer (LFE IN port) to the receiver (LFE or SUB Pre-Out port). Connecting all the speakers to the receiver should not take more than 20 minutes, and if you have all the tools you need, you can mount it and wire everything in 2-3 hours. The subwoofer features one 8-inch down-firing driver with 8-inch passive radiator. It has a built-in amplifier (powered subwoofer) with a power output of 250W (RMS). Subwoofer’s frequency response spans from 40Hz to 150Hz. You will find low-pass filter, level inputs and outputs, as well as LFE input on the rear panel. Center speaker features two 3.25-inch mid-bass drivers, one 1-inch aluminum tweeter, and two 3.25-inch passive radiators. Speaker’s frequency response spans from 55Hz to 30kHz. Their sensitivity is 89dB and recommended amplification is 10W to 175W. Each satellite features one 3.25-inch mid-bass woofer, 1-inch aluminum tweeter, and one 3.25-inch passive radiator. Their frequency response spans from 65Hz to 30kHz, sensitivity is 88dB, and recommended power output of the receiver is 10W-150W per channel. Definitive Technology ProCinema 600 delivers excellent sound for its size. Mids and highs are crisp and detailed. The subwoofer brings some depth but to be honest, it’s not as punchy as we would like it to be. Combining the speakers with Definitive Technology Pro SUB 800 (or even better Pro SUB 1000) would improve the general impression a lot. But even with this subwoofer, all the explosions, car chases, and crazy action scenes will sound much better. One more thing that could have been better is the center speaker. It’s great with mids and highs but it’s not that great with deep male voices – they don’t always sound perfectly clear. The subwoofer makes some kind of rattling sound at high volumes especially when a bass-heavy music is played. ProCinema 600 is the cheapest Definitive Technology speaker system but we still think it’s too pricey. And for the price, you get only the speakers – there is no speaker wire, no RCA cable, no mounting equipment, and no banana plugs for speakers. This is another affordable home theater speaker system. SXHTB-BK is 5.0 system made by Fluance and it’s one of the best mid-end systems on the market. It’s not an exaggeration when we say that buying Fluance SXHTB-BK could be one of the best things you have ever bought. All the speakers in this package are extremely well-built, reasonably priced, and they deliver incredibly rich and powerful sound. The only thing you might want to improve is the bass response but you can easily make an upgrade and buy a complementary Fluance 12-inch subwoofer. Even if you decide to make this upgrade, it will cost you so much less than any high-end 5.1 system and it will sound better than most of them. Fluance SXHTB-BK 5.0 (or 5.1) system is definitely in top three systems on the market when it comes to price/quality ratio and it certainly deserves our recommendation. A little warning before we start. These speakers are huge and really heavy, especially the floor standing speakers. Each speaker comes in a separate box and it’s well protected. The combined weight of all the boxes is about 100 pounds (without the subwoofer). You will get a user manual and a lifetime warranty for all the passive speakers (parts and labor). Along with those two floor standing speakers, you will get isolation floor spikes (x8). These floor spikes will reduce the vibrations of the surface and make the sound cleaner and distortion-free. Speaker wire, banana plugs, and mounting kit (wall brackets, etc.) are not included. Fluance recommends using 12-gauge speaker wire. Banana plugs are not absolutely necessary but they are more convenient solution than bare wires. You should be really careful when choosing the right set of wall brackets – center and surround speakers are much heavier than any of those satellite speakers we’ve talked about. You will need really strong wall brackets. 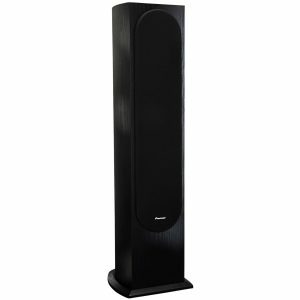 Floor standing speakers (towers) are 38.8 inches high, 7.8 inches wide, and 13 inches deep. Each tower speaker weighs 33.45 pounds. The center speaker weighs 9 pounds, it’s 15.8 inches wide, 5.24 inches high, and 7.9 inches deep. Surround speakers weigh 11.6 pounds each. They are 13.5 inches high, 8.3 inches wide, 9.1 inches deep. First of all, there’s the design. They really look monumental but elegant at the same time. The system is available in 2 colors – black and natural walnut. Each speaker has a removable cloth grille. They look really good with or without the grill and you can try both options and see how you like them. All the enclosures are made of MDF and everything looks and feels sturdy and very strong. Fluance really made these speakers durable. After all, they don’t give a lifetime warranty (limited) for nothing. Connecting the speakers is easy and relatively simple. The only thing that could be a little bit confusing is connecting those huge floor standing speakers because they have not two wire terminals but four. There are three ways to connect them. The first and the simplest is using only one pair of wire terminals on the speaker’s rear panel and one pair of terminals on your receiver (and you must not remove that gold-plated bridge connecting those two pairs of wire terminals). The other two connection methods are called Bi-amp and Bi-wire connections and they can improve the performance of your home theater speaker system. What method you are going to choose is only up to you, but you should know that bi-amp connection offers the best performance (less distortion) and it reduces the possibility of amplifier overload (because you have to use 2 amplifier channels instead of one). If you choose a by-wire connection, you are going to use all four wire terminals on the speaker but only one amplifier channel. Bi-wire connection improves the soundstage and that’s the greatest advantage of this type of connection. You can find all the info on different types of connections, their advantages, disadvantages and detailed wiring schemes in the user manual. If you follow all the instructions from the manual, you should be able to connect everything on your own. The center speaker, as well as surround speakers, are wall-mountable but you will need some really strong wall brackets since the speakers are heavy. Floor standing speakers feature 3 drivers – two 6.5-inch woofers with 2 bass reflex ports on the rear panel of the speaker and one 1-inch dome tweeter. They can handle maximum power input of 160W (50W RMS power input). Their frequency response spans from 49Hz to 20kHz and sensitivity is 89dB. The center speaker features 3 drivers – two 4-inch woofers (with bass reflex ports) and one 1-inch neodymium tweeter. It can handle 100W of peak power input (RMS power input is rated at 30W). Frequency response spans from 80Hz to 20kHz and its sensitivity is 88dB. Surround speakers have 2 drivers – one 4-inch woofer and one 1-inch tweeter. They can handle 100W of peak power input and 30W RMS. Their frequency response spans from 50Hz to 20kHz and sensitivity is 89dB. Each speaker has 8Ω impedance. Listening to this speaker system was quite a fun. For the price, this beast really sounds impressive, especially with that additional 12-inch subwoofer. Even without the sub, you will get super-clean and detailed mids and sparkling highs. Bass response is not perfect but it complements the sound of the system and it really improves the experience, especially when watching movies. Music sounds really good, too. Fluance SXHTB-BK can’t compete with some high-end systems that cost 5 or 10 times more but it offers great value for your money. First, there’s the size of the system. It’s not something that we don’t like – we are just trying to warn you that you will have to make some space for those gigantic towers. Second, if you want a really strong punch, you won’t be completely satisfied with the sound. Luckily, you can make an upgrade at any moment. There are 10 and 12-inch Fluance complementary subwoofers that are going to sound and look great with this 5.0 speaker system. The next home theater speaker system on this list is a bit on the expensive side and it usually costs about $1.200 (or about $1.000 if you are lucky). SVS is well-known for making high-end audio equipment (all kinds of speakers and accessories) and SVS Prime Satellite 5.1 system is actually one of the cheapest SVS home theater speaker systems you can buy. The system delivers exceptionally accurate sound with a super-punchy bass and we can’t think of the reason why you shouldn’t buy it if you have the money. It’s a perfect choice for small and mid-sized rooms. 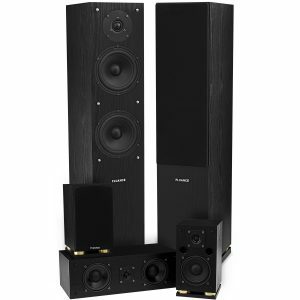 If you have a large room, you might want to consider buying SVS Prime bookshelf (~$1.000 for a pair) or tower speakers (~$1.200 for a pair) and replacing front left and right satellites with these. Also, you could replace the center satellite speaker with SVS Prime Center Speaker (~$400). That kind of a system (with two bookshelf/tower speakers, center speaker, two surround satellites, and a subwoofer) would cost you more than $2.000. Most people would be perfectly happy with a smaller system with 5 satellite speakers and one 12-inch subwoofer and that’s why we’ve decided to go with this one. All the speakers are packed inside one large 60-pound box. Inside the package, you will find a set of 6 speakers (one sub and five satellites), speaker wire, owner’s manual for the subwoofer (SB-1000), owner’s manual for the satellites, and a 5-year warranty for all the speakers (this is probably the most comprehensive warranty of all the speakers and speaker manufacturers on the list). Satellites are wall-mountable but you won’t get the mounting kit (you have to buy it separately). Also, you won’t get banana plugs so you might want to buy them, too (they are not absolutely necessary but they are more convenient). The subwoofer weighs 27 pounds, it’s 13.5 inches high, 13 inches wide, 14.6 inches deep. Each satellite weighs 6.5 pounds. They are 8.85 inches high, 4.9 inches wide, and 6.3 inches deep. The system looks nice and elegant. Two versions are available – one with black ash finish (for some reason, it costs $200 less which is not negligible) and the other with a piano glossy finish (looks more elegant but it’s more expensive and it’s a real fingertip magnet). Each speaker comes with a removable cloth grille. All the speakers look compact and sturdy. They might seem expensive but when you consider the fact that they could be a part of your home theater system for 10 or more years the price is not too high anymore. If you ask us, buying one expensive speaker system that’s going to last for 10 years is a much better option, than changing 3 or four cheaper poor-quality systems during the same time period. You would avoid all the frustration caused by blown speakers, poor sound quality and distorted bass, and you would spend pretty much the same amount of money. SVS offers a 5-year comprehensive unconditional warranty which is such a rare thing nowadays. All the satellites are mountable but you will have to buy the mounting kit separately. The setup process is pretty much standard. If you have a receiver with SUB pre-out port, and most of the new AV receivers have that port, you just have to use the right LFE input port on the rear panel of the subwoofer. You won’t get the cable for hooking up the sub to the receiver so be sure to buy it before you start the installation. All the satellites have regular wire terminals and connecting them is always simple. The installation and wiring should take no more than two hours (it will take more if you want to mount them on walls). The subwoofer features one large 12-inch front-firing driver. The subwoofer is powered and the enclosure is sealed. Frequency response spans from 24Hz to 260kHz. The built-in amplifier has continuous power output rated at 300W, and peak dynamic power output is rated at 720W. The subwoofer features volume knob, low-pass filter, and phase controls. It also features line-level inputs and outputs as well as high-level inputs. Each Prime satellite features two drivers – 4.5-inch polypropylene-cone woofer, and 1-inch aluminum-dome tweeter. There is a wide-flared port on the rear panel of each speaker for improved low-end reproduction. They all have 8Ω impedance, 85dB sensitivity, their frequency response is 69Hz to 25kHz (crossover at 2kHz). You can use any receiver with 20W to 150W of continuous output power per channel to drive the speakers. 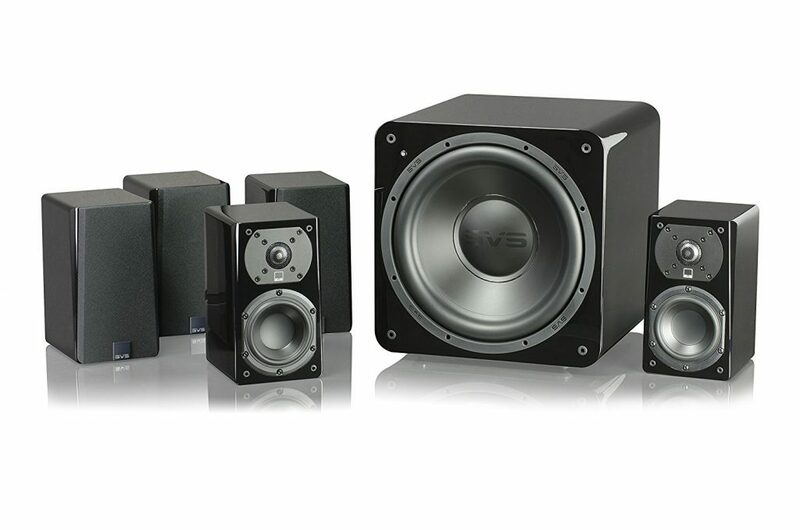 SVS Prime satellite 5.1 speaker system sounds just like you would expect a $1.000 system to sound. The subwoofer delivers strong and punchy bass and watching movies with that kind of bass is such a great experience. It really brings all those low-end sound effects to life. Satellites deliver full and detailed mids and highs. The only problem is the reproduction of the upper-bass frequencies, it’s not like they lack impact but they could be fuller. It becomes noticeable when the center speaker has to reproduce some male voices and that’s something that could be improved by replacing that one center speaker with SVS Prime center speaker. This speaker system is great for music, too. The sound is close to perfect but if you want the best possible combo, you should replace three satellites (Center, FL, and FR) with Prime Center Speaker and two Prime bookshelf/tower speakers. Blue LED status light on the front panel of the subwoofer can be really annoying. HKTS 30BQ is an attractive and compact mid-end system that’s perfect for smaller rooms, especially for movie watching. It’s not the best on the market and it is maybe slightly overpriced but it’s still affordable and delivers pretty good sound quality for the size and price. The subwoofer weighs 19.8 pounds, it is 13.9 inches high, 10.5 inches wide, and 10.5 inches deep. The center speaker weighs 3.2 pounds, it’s 4.3 inches high, 10.7 inches wide, and 3.5 inches deep. Each satellite speaker (FL, FR, Surrounds) speaker weighs 3.3 pounds. They are 11.8 inches high, 4.3 inches wide, and 3.5 inches deep. HKTS 30BQ is a sleek and elegant speaker system with a glossy coating. There is only one model available and it’s shiny and black. Satellites and center speaker have transparent and removable aluminum grilles while the subwoofer has a removable cloth grille. All the speakers are made of plastic. The plastic is thick and sturdy but the speakers don’t feel as durable as some other models on this list. Connecting the system to the receiver is quite simple. You have dedicated LFE input on the rear panel of the sub and that’s the one you are going to use if your receiver has SUB pre-out port. The only thing that can be really tricky is mounting the satellite speakers. Wall mounting brackets are poorly designed and built and you might want to buy some other wall brackets and avoid all the frustration. Another good thing about this system is that you can upgrade it to 7.1 by adding two HKTS 30 satellites (~$170). The subwoofer features 8-inch driver. The enclosure is sealed and the subwoofer is active (powered). The amplifier’s continuous power output is rated at 200W (RMS power rating). The sub can produce low-end tones down to 45Hz. The sub features phase switch and bass boost switch as well as the bass volume knob. It also features LFE input and two RCA Level Inputs. All the satellites and center speaker have 8Ω impedance, 86dB sensitivity. Each speaker features 3 drivers – two 3-inch woofers and one 0.75-inch tweeter. They can go up to 20kHZ. There is no info on their full frequency response and we are going to talk about sound quality and quality of reproduction later. The speakers can be driven by any amplifier/receiver with an output power 10W-120W per channel. HKTS 30BQ sounds good for the price but it’s not perfect. 8-inch subwoofer improves the sound significantly and it brings action scenes to life but it doesn’t reproduce really low bass well (it doesn’t reproduce it at all). The system also sounds like there is a gap in frequency response somewhere in the mid-bass range – deep male voices might sound thin. That’s what really needs to be improved. Mids are detailed and dynamic and highs are sparkling. This system is pretty good for watching movies but it’s not that good when it comes to music playback (especially bass-heavy music). There are two things we don’t like. The subwoofer is simply too small to make a greater impact. Bass is too weak and it lacks texture. This becomes really noticeable when you try to play some bass-heavy music. The second thing we don’t like is that gap in frequency response. Improving the center and FL and FR speakers would make such a great difference. If you are tired of cables and you are looking for a more convenient solution, we have prepared for you two wireless speaker systems SONOS 5.1 and Enclave Audio Cinehome 5.1. You should be aware that these are not completely wireless and that all the speakers need to be hooked up to the wall sockets (not battery powered) but all those long cables going from the receiver to the speakers are eliminated. You don’t even need a receiver (amplifier) to make these speaker systems work. One of the speakers (usually the center speaker or the soundbar) acts as the main unit and it communicates with all the other speakers in the system. Wireless speaker systems are usually more expensive than wired but that doesn’t mean they sound better. Most wired speaker systems within the same price range will perform better than wireless. So, why would you buy a wireless system? Well, mostly because of the convenience but also because they don’t sound bad at all. Unless you are an audiophile, you will be perfectly happy with some high-end wireless speaker system even though you can find louder, stronger, more balanced wired system for the same amount of money. If you want to find out more about wireless systems and see more options, you should read our article on 8 best wireless surround sound systems in 2019. SONOS is the most popular brand when it comes to wireless speakers, especially when it comes to wireless multiroom speaker systems. 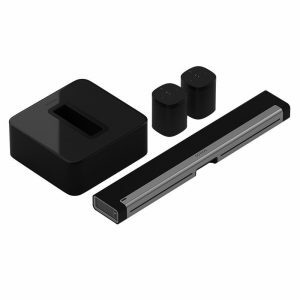 4 years ago, SONOS introduced its soundbar (it was named the PLAYBAR) and short after that, SONOS made it possible to combine this soundbar with SONOS subwoofer (SUB) and two SONOS wireless speakers (they don’t have to be SONOS ONE, you can also use PLAY:1, PLAY:3, PLAY:5). SONOS allows you to combine different speakers into 5.1 system – you can buy PLAYBASE (SONOS sound base) instead of PLAYBAR, and you can use any of those small SONOS speakers as surround channels. Also, you don’t really have to buy the whole bundle at once if you don’t have that kind of money. You can buy each piece of equipment separately – start with their soundbar, and then make further upgrades. Each speaker of this system is packed separately in a premium box. They are all well-protected and wrapped in some kind of cloth. The PLAYBAR comes with all the necessary cables (Ethernet, power cable, digital optical), with a quick start guide, and 1-year warranty card. The SONOS SUB comes with a power cable, user manual, and 1-year warranty card just like the speakers. Along with those two SONOS ONE speakers, you will also get flat Ethernet cables. SONOS ONE speakers can be part of the system but they can also work as individual speakers (or they can be part of a multiroom system). Mounting kits (wall brackets, screws) and floor stands are not included in the package – you have to buy them separately. The PLAYBAR’s dimensions are 35.43in (width), 5.51in (height), and 3.35in (depth). It weighs 11.9 pounds. The SUB’s dimensions are 15.3in (height), 15.8 (width), and 6.2in (depth). It weighs 36 pounds. 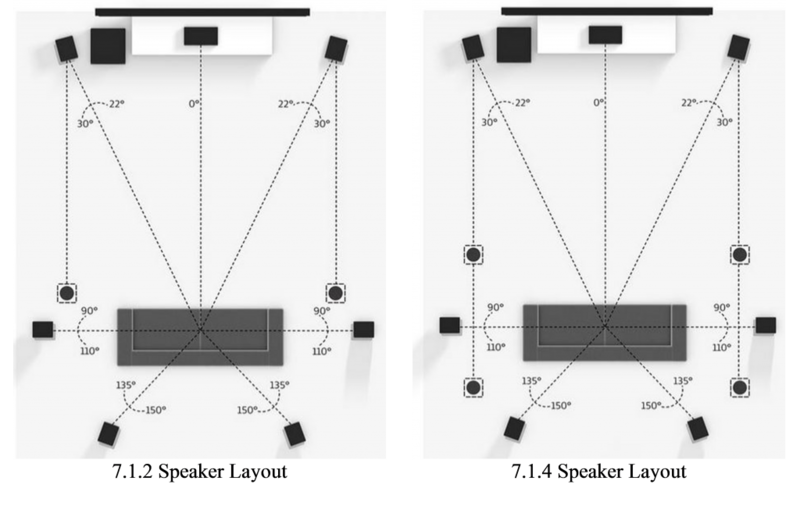 SONOS ONE’s dimensions are 6.4in (height), 4.7in (width), and 4.7in (depth). It weighs 4.1 pounds. The SONOS system looks sleek and elegant. SONOS paid attention to every detail and the result is that stylish and simple look. PLAYBAR and black SONOS ONE speakers are a perfect match. The SUB is the only part of the system with a glossy finish and it looks a bit different than other speakers. All the speakers are made of hard industrial plastic, they look quite sturdy and durable. Be careful with the SUB not because it’s more fragile than other speakers but because even the smallest scratch is really noticeable on that glossy finish. The installation of a wireless system is usually much simpler and less frustrating than the installation of a wired system. The only thing you need to do is to connect the TV to the PLAYBAR, connect the PLAYBAR to your Wi-Fi network via Ethernet cable, and plug it in. Pairing the speakers with the PLAYBAR and all the adjustments are done through the SONOS app (sound calibration, EQ adjustments, etc.). The PLAYBAR features 6 woofers arranged in 3 groups. That way, you get better separation between left, center and right channels. There are also 3 tweeters inside, two on each end and one in the middle right between two woofers representing the center channel. This kind of driver arrangement should provide wide soundstage with perfect reproduction of mids and highs. The SUB features 2 6-inch woofers facing and firing at each other in order to reduce cabinet vibrations. The lower limit of the frequency response is 25Hz. Each SONOS ONE speaker features two drivers – one woofer and one tweeter. All the speakers are active and have built-in class-D amplifiers. SONOS doesn’t offer any info on technical specifications. SONOS managed to make a comprehensive quick start guide (40 pages) but forgot to mention specs. Impedance and power ratings are not that important since all the speakers are active and you don’t have to match them with your receiver’s power output but it would be nice to know something about the drivers (like frequency response or sensitivity). SONOS decided to adopt BOSE’s strategy and we are not completely happy with that but still, the most important thing is how the speakers sound, not what the numbers say. SONOS 5.1 offers pretty good listening experience. Those nine drivers inside the PLAYBAR make really wide soundstage, wider than the majority of soundbars (wired or wireless) on the market. Mids and highs are crisp and detailed. All the dialogues sound perfect. Bass response is probably the worst thing about this system. It’s not like there is no bass at all – it’s there and it really improves the overall sound quality and brings some action scenes to life but if you really want to get immersed in the movie, you need much larger drivers and larger cabinet. Unfortunately, you can’t buy some random subwoofer and replace the SUB since it has to be SONOS SUB and it has to be wireless. And this one is the only available. The system is also quite loud and there is no noticeable distortion at high volumes. We should also mention that SONOS app works like a charm and it makes everything much easier. You can use it to control the volume, change EQ settings, activate special sound modes (Speech Enhancement and Night Mode), or stream music from any of the supported streaming services (there are more than 80 supported services). SONOS 5.1 doesn’t feature support for any DTS surround sound audio format. It supports only Dolby Digital 5.1. There is only one input port on the PLAYBAR (digital optical), and you are supposed to connect all the devices to your TV and then send all the audio from your TV to the PLAYBAR via digital optical cable. Part of the SONOS app called TRUEPLAY automatic sound calibration tool works only on iPhone (and other Apple devices). TRUEPLAY won’t work on Android devices. SONOS 5.1 is an expensive system and most of the wired home theater speaker systems within this price range deliver better performance. But, SONOS is more convenient than with any of those wired systems. Enclave Audio is one of the youngest players on the market. Cinehome HD 5.1 is their first home theater speaker system. Unlike SONOS and other manufacturers that decided to make an ‘’incomplete” 5.1 wireless speaker system (you will usually get four speakers – soundbar (which is a substitute for FL, C, and FR channels), two surrounds, and a subwoofer instead of 6 separate speakers) Cinehome HD 5.1 is a real 5.1 home theater speaker system. It offers much better stereo separation between FL and FR channels than any other wireless system. It also beats SONOS when it comes to the number of inputs and outputs (3x HMDI inputs, 1x digital optical input, and 1 HDMI ARC output). Cinehome HD 5.1 supports Dolby Digital 5.1 and DTS 5.1 while SONOS 5.1 supports only Dolby Digital 5.1. Also, Cinehome is significantly cheaper than SONOS 5.1. On the other hand, SONOS has a much better app and it’s more user-friendly. The speaker system comes in a large 65-pound box. Inside the box, you will find six speakers, each packed in a separate box. Besides the speakers, you will get one HDMI cable (not four for all the ports), power cables for each speaker, a remote controller, user manual, and a warranty card (3 years on cabinets and drivers, 1 year on electronic components, limited lifetime warranty on cables). The subwoofer’s dimensions are 17.7in (height), 12in (width), 13in (depth). The center speaker’s dimensions are 12.4in (width), 5in (height), and 7.7in (depth). The center speaker is also the main unit and all the connection ports are on it. Front left and right speakers are 12.4 inches high, 7.7 inches deep, and 4.7 inches wide. Surround speakers are 5 inches high, 4.3 inches deep, and 8.1 inches wide. The remote that comes with Cinehome HD 5.1 is really small and simple and it enables you to control only the basic stuff. For all the advanced adjustments, you have to use the on-screen menu. This speaker system doesn’t really look special or distinctive in any way. All the speakers are completely black with black cloth grille covering the front side and protecting the drivers. All the speakers are made of really hard plastic and feel sturdy and durable. It would be nicer to see MDF cabinets but this plastic doesn’t look too bad. The installation is simple and quick. This is basically plug-and-play device. It doesn’t use your Wi-Fi so you don’t have to worry about the interference with other devices and it won’t slow down your internet connection. The center speaker generates the network that all the other speakers use to communicate with it. You have all the instructions about the speaker placement in the user manual and all the speakers are labeled, so you don’t need more than 15 minutes to place them appropriately, plug them in, and connect all the input and output devices to the main unit. Just like SONOS, Enclave Audio doesn’t offer any info about the drivers. Some specs are not that important (like impedance and power ratings) since all the speakers have built-in amps and you don’t need to match the speakers with the receiver (you don’t need a receiver at all). On the other hand, it would be nice to know other specs like frequency response of each speaker (especially if you don’t have the opportunity to hear them) and their sensitivity. The speakers don’t sound bad at all and it would be nice to know at least some technical specifications. Enclave audio Cinehome 5.1 delivers very good sound for a wireless system. The separation between left and right channels is really good. Mids and highs are rich and detailed and dialogues are perfectly clear. Bi-pole surround speakers spread the sound around you creating an incredibly immersive listening experience. Bass response is great for a wireless system but it could be better (or deeper). Cinehome 5.1 also features Bluetooth connectivity and you can pair any Bluetooth-enabled device with it. The remote that comes with the speaker system is poorly designed and built. HDMI ports are 1.4, not HDMI 2.0 and they are not compliant with HDCP 2.2 (you can’t watch 4K Ultra HD videos). If you want to make any adjustments you have to use HDMI ARC connection (you have to connect the TV to the center channel via HDMI ARC output) in order to see the on-screen menu and to make adjustments. You won’t be able to see this menu if you connect them via digital optical cable. In case you want to make your own home theater speaker system by combining different speakers (don’t want to buy the whole 5.1 package), you should look at our list of best home theater speakers by type. We have tried to pick the best subwoofers (8-inch, 10-inch, 12-inch, and 15-inch), best center speakers, best front speakers (bookshelf and floor standing speakers), best surround (rear) speakers, and best height speakers (in-ceiling and elevation speakers) and tell you something about their features and flaws. You can definitely find some interesting choices here. Yamaha YST-SW012 is a small (11.4 inches high, 11.4 inches wide, 12.9 inches deep, it weighs 20 pounds) and relatively affordable subwoofer. It comes with a subwoofer cable (RCA to RCA), non-skid pads, and a 2-year warranty card. The subwoofer is active and has a ported enclosure. Inside the sub, there is one 8-inch woofer. The bass reflex port is on the right side. The built-in amp can output 50W of power (continuously) and peak power output is rated at 100W. Its frequency response spans from 28Hz to 200Hz. There is only one input. No speaker level inputs and outputs which means that you can’t connect it to older receivers without SUB pre-out port (you can buy some additional equipment and do that but that’s just too complicated). Polk PSW10 is a 10-inch powered subwoofer. It comes in a large 30-pound box. It is 14 inches wide, 14.4 inches high, 16.1 inches deep and it weighs 26 pounds. Along with the subwoofer, you will get a user manual, an online registration card, and a warranty (5 years on enclosure and driver, and 3 years on the amplifier). The sub has one 10-inch front-firing driver with a bass reflex port on the front side. Build-in amp can output 50W of power continuously (Peak power output is 100W). Frequency response spans from 35Hz to 200Hz. Crossover frequency can be set between 80Hz and 160Hz. Pretty accurate reproduction and punchy bass for its size. It features volume and crossover controls as well as the phase switch. It features multiple inputs – LINE IN and speakers level inputs as well as speaker level outputs. Suitable for small and mid-sized rooms. Not suitable for large rooms (low power output). No LFE input but you can use any of those LINE IN inputs to connect it to the receiver via RCA cable. Cables are not included in the package. BIC F12 is a reasonably priced 12-inch powered subwoofer. It is 17 inches high, 14.75 inches wide, 17.25 inches deep, and it weighs 42 pounds. Along with the sub, you will get a user manual and 5-year warranty. Cables and banana plugs (you need them if you want to use speaker level inputs/outputs) are not included. The subwoofer features one 12-inch front firing driver with a bass reflex port on the rear panel. The built-in amp can output 150W of power continuously (475W Peak Power Output). Frequency response spans from 25Hz to 200Hz. Its sensitivity is 90dB and impedance is 8Ω. It features gold-plated speaker level inputs and outputs as well as LFE input. There are also crossover and bass volume knobs and phase switch on the rear panel. Not a great choice for large rooms because of low RMS power output. 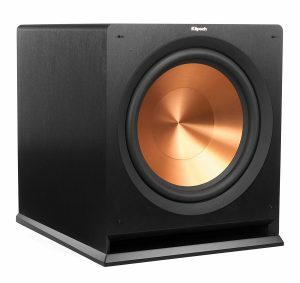 Klipsch R-115SW is a huge and expensive 15-inch powered subwoofer. The sub is 21.5 inches high, 19.5 inches wide, 22.3 inches deep, and it weighs incredible 75.4 pounds. The sub comes with a user manual and 5-year warranty (2-year warranty on the amp). Cable is not included and you should buy it separately. This sub is WA-2 capable which means that it can be used as wireless if you buy WA-2 subwoofer wireless kit (kit is not included). The R-115SW subwoofer features 15-inch front-firing woofer with a bass reflex port on the front side. The enclosure is made of MDF. Digital built-in amplifier has RMS power output rated at 400W (800W Peak Power Output). Frequency response spans from 18Hz to 125Hz. Excellent bass response. Floor-shaking bass with a lot of punch. It features left and right RCA inputs. Left RCA can be used as LFE input. It has a crossover knob (40Hz to 130Hz), gain knob, and phase switch. There is also a WA-2 port on the rear panel of the subwoofer – you can use it to connect Klipsch WA-2 wireless kit and make the subwoofer wireless. It’s really expensive. Still, it delivers excellent performance and if you can spend that much on a subwoofer, you should definitely buy it. You can’t use it with some small speakers because they will sound so tiny. You need a system (FL, FR, C, SL, SR) that matches the performance of this subwoofer. That means that you will have to spend a few thousand on a whole system. Polk CS10 is an affordable budget center speaker. It comes with a user manual, 5-year warranty, and 4 rubber feet. Speaker wire is not included. The speaker is 20.1 inches wide, 9.6 inches high, 9.9 inches deep, and 16 pounds heavy. CS10 features two 5.25-inch full-range woofers and one 1-inch tweeter. The cabinet is made of MDF and it’s vented for a better bass response. It can handle up to 125W of power (20W RMS power input). It has 8Ω impedance and 91dB sensitivity. Frequency response spans from 53Hz to 25kHz. Crossover is set at 2500hz. Simple and stylish design with woodgrain vinyl finish, removable black cloth grille, and angled top. Great build quality – MDF cabinet, high-quality drivers. Works with most of today’s AV receivers. Delivers rich mids and highs with plenty of detail. Most of the dialogues are loud and clear. Matching CS10 with your other speakers could be a difficult job. The manufacturer recommends using their speakers from TSi series. CS10 struggles with mid-bass frequencies. Some deep male voices might sound a little bit muffled. BIC DV-62CLRS comes with a user manual and 7-year limited warranty on parts. Speaker wire is not included. The speaker is 20 inches wide, 7.7 inches high, 10 inches deep, and it weighs 25 pounds. Inside sturdy MDF cabinet with a magnetic shielding, there are two 6.5-inch woofers and one 0.75-inch tweeter. The speaker has 8Ω impedance and 90dB sensitivity. Frequency response spans from 38Hz to 20kHz and crossover is set at 3500Hz. Recommended amplifier power output is 10W to 175W per channel which means that most of today’s receivers can drive it. Simple and elegant design with a removable black cloth grille. It blends in easily with other audio equipment and furniture. It’s easy to install and it is wall-mountable. Strong and durable MDF cabinet and gold-plated wire terminals. 7-years limited warranty. Nice and smooth highs, mids and mid-treble frequencies are dynamic and detailed. Most of the voices are perfectly clear. A bit on a bulky side. 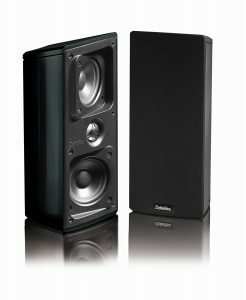 Larger than other affordable center speakers. Mid-bass frequencies are problematic. They lack impact and sound a bit muffled at times. If you are on a budget Micca MB42 is one of the best cheap choices. They are not made for audiophiles but if you don’t have that kind of high standards, you will be happy with these two bookshelf speakers. After all, only a crazy person could expect an audiophile experience for less than $60 (for a pair of speakers). MB42 speakers come in a 9-pound box. Each speaker is 9.5 inches high, 5.8 inches wide, 6.5 inches deep, and weighs 3 pounds. Along with speakers, you will get a user manual and a warranty card. Speaker wire is not included. Inside vented MDF enclosure, you will see two drivers – one 4-inch woofer made of carbon fiber and 0.75-inch silk dome tweeter. Speaker’s impedance is within the range 4Ω-8Ω and sensitivity is 85dB. Speakers can handle up to 75W of input power (Peak Power Input) and it’s recommended to use a receiver with 10W-150W power output. Frequency response spans from 60Hz to 20kHz. MB42 speakers really look elegant and more expensive than they really are. Surprisingly well-built. Durable enclosure, good-quality drivers. Speakers have binding posts and not spring clips which is unusual for such a cheap pair of speakers. Reasonably good sound quality for the price. Bass response is far from perfect but when you combine them with some nice subwoofer and set the crossover appropriately, it’s not that terrible. Mids and highs are clear and dynamic. Really good value for your money. 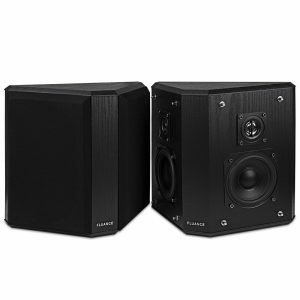 R-15M speakers offer great performance for a reasonable price. They are much more expensive than Micca MB42 but they also offer much better listening experience (for music and for movies). A pair of speakers come in a 24-pound box. Each speaker weighs 10.3 pounds. They are 12.5 inches high, 7 inches wide, and 8.1 inches deep. The speakers come with a user manual, spec sheet, and 5-year warranty. Speaker wire and banana plugs are not included. Inside a cabinet, you will see two drivers – one 5.25-inch high-output IMG woofer and 1-inch LTS tweeter. Speaker has 8Ω impedance and 94 dB sensitivity. Frequency response spans from 62Hz to 24kHz (crossover is set at 1800Hz). Speaker can handle 85W of continuous power input (RMS) and Peak power input is rated at 340W which means that you need some stronger mid-end or high-end receiver to drive these speakers and get the best results. Sleek and stylish design – MDF cabinet with a brushed black finish, spun copper woofer, removable black cloth grille. Great sound quality – rich, dynamic, and detailed mids and highs, decent low-end reproduction. All in all, the sound is nicely balanced. Reasonable price for that kind of performance. Bass lacks some texture but if you pair them with a nice subwoofer and set the crossover appropriately, you will get an incredible sound and perfect balance between lows, mids, and highs. 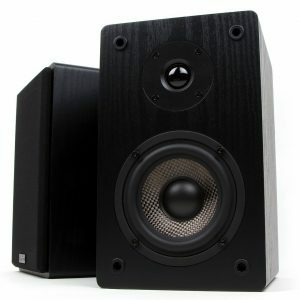 If you are looking for an affordable floor standing speaker, Polk Audio Monitor 60 Series II is one of the best options. It offers more than satisfying performance for less than $100 (per speaker). The speaker comes with owner’s manual and 5-year warranty. Speaker wire and banana plugs are not included. The speaker is 37.5 inches high, 14 inches deep, 7 inches wide, and it weighs 31 pounds. The speaker features 4 drivers – three 5.25-inch woofers and one 1-inch tweeter. They are all packed inside a large ported MDF cabinet (bass reflex port is on the front side). Speaker’s impedance is 8Ω and sensitivity is 90dB. It can handle up to 200W of power input (this is the Peak power rating). Its frequency response spans from 38Hz to 25kHz. Note: In order to get best possible performance, you should use Bi-amp or Bi-wire connection. 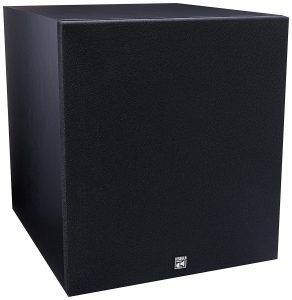 Affordable price – Polk Audio Monitor 60 Series II is one of the cheapest floor standing speakers. Elegant design – Sleek and stylish look, MDF cabinet with a nice black vinyl finish, black cloth grille. Durable and sturdy enclosure – it’ made to last and it also comes with 5-year warranty. Great sound quality for the price –crisp and clear mids, detailed and sparkling highs, decent lows. Nice balance across a wide range of frequencies. Low-end reproduction is not impressive. There is no enough punch but the bass is clear and it doesn’t get distorted at high volumes. Removable grilles look cheap and poorly built. This is another affordable floor standing speaker. It comes with a user manual and 1-year warranty. Speaker wire and banana plugs are not included. The speaker is 35.2 inches high, 8.9 inches wide, 10.6 inches deep, and it weighs 25 pounds. The speaker features 4 drivers – 2 full-range 5.25-inch woofers, one 5.25-inch mid-range woofer, and one 1-inch tweeter. They are all packed inside sturdy RF molded cabinet (not magnetically shielded). The cabinet is ported and bass reflex port is on the rear panel. Speaker has 6Ω impedance and 87dB sensitivity. Speaker’s peak input power is 130W. Frequency response spans from 40Hz to 20kHz and crossover frequencies are set at 250Hz and 3kHz. The speaker looks really stylish. Both cabinet and protective removable grille are black and they will blend in easily with your furniture and other audio and video equipment. Everything looks strong and sturdy. That 1-year warranty made us a little suspicious since other manufacturers offer a 5-year warranty but we couldn’t really find any flaw regarding the build-quality and durability. The sound is nicely balanced. Mids are accurate and dynamic, highs are sparkling, the bass is there but it lacks body. Bass-heavy movie scenes and bass-heavy music don’t sound great. The bass is kind of shallow and it doesn’t provide enough rumble. You should probably combine these floor standing speakers with a good subwoofer, set the crossovers appropriately and you will get much better results. You don’t actually need perfect satellite speakers but if you really want excellence, Mythos Gem Satellite Speakers are the way to go. They are multipurpose speakers and can be even used as FL and FR speakers. Speakers come in a 9-pound box. You will get a user manual and a warranty card with the speakers. Mounting kit (brackets, screws) is included. Each speaker weighs 4.4 pounds. They are 10.25-inch high, 4.15 inches wide, and 4.25 inches deep. Inside the sealed hard-plastic enclosure, you will see three drivers – two mid-range woofers and one 1-inch tweeter. The speaker’s impedance is 8Ω and sensitivity is 89dB. They can be driven by any receiver that can output 10W -200W of power per channel. Frequency response spans from 60Hz to 30kHz. Attractive design – nice-looking enclosures with glossy black or polished aluminum finish. They are small and compact. The enclosure is made of plastic but it looks sturdy and durable. Mythos Gem Satellites deliver great surround experience and sound very good for their size. The accent is on mids and highs which are crisp and clear. Low-end reproduction is pretty bad. There is practically no depth but that’s what you can expect from a small surround speaker. Our impression is that these speakers are overpriced – it’s like you are paying more for the style and brand than for the performance. LU43PB is an affordable, small, and compact satellite speaker. It’s probably one of the cheapest on the market (a pair of speakers costs about $30) and it delivers decent sound for that kind of money. If you are on a budget or you don’t want to spend too much on surround speakers, this is one of the best options. A pair of speakers comes with a user manual and 1-year limited warranty. It comes with swiveling wall brackets, so you don’t have to buy those separately. Speaker wire is not included. The speaker is 8.25 inches high, 5.25 inches wide, 5.25 inches deep, and it weighs 2.8 pounds. The cabinet is made of ABS and it’s sealed. Inside the cabinet, there are three drivers – one 4-inch full-range woofer, one 1.6-inch polypropylene mid-range woofer, and one 1-inch tweeter. Speaker’s impedance is rated at 4-6Ω and sensitivity is 85.5dB. The speaker can handle maximum input power of 100W (there is also a version with 125W Peak Power Input). RMS power input is rated at 50W. Frequency response spans from 100Hz to 20kHz. Simple and stylish design and small size. The drivers are protected with an aluminum grille. Speakers are available in two colors – black and white. The speakers are mountable and easy to install. LU43PB speakers offer pretty good surround sound experience. Mids and highs are clear but not detailed enough, mid-bass and really low frequencies sound a bit shallow and weak (reproduction of low frequencies is not really the main goal of surround speakers and that’s why this is not such a big flaw). Build quality is not the greatest. The speakers are made of plastic and you should handle them with care (especially during the installation and mounting). Speakers feature spring clips (not binding posts). The last pair of surround speakers we’ve picked is a bit more expensive than the previous two but it’s more expensive for a reason. Fluance AVBP2 is a pair of bipolar surround speakers. Bipolar speakers, unlike monopole speakers (the previous two models), have speakers placed on opposing sides of the cabinet. That way, you will get much better dispersion of sound and more immersive listening experience. 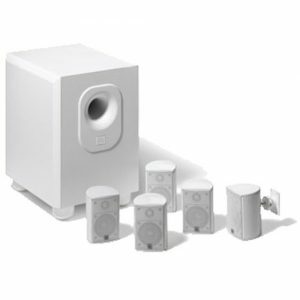 These surround speakers are a perfect choice for any 5.1 or 7.1 home theater speaker system. Inside a 17-pound box, you will find a pair of AVBP2 speakers, user manual, lifetime warranty on parts and labor. Speaker wire, mounting kit (speakers are mountable), and banana plugs are not included in the package. One AVBP2 speaker weighs 6.8 pounds, it’s 11 inches wide, 10.2 inches high, and 5.5 inches deep. Inside strong MDF cabinet, there are 4 drivers – dual 4-inch woofers and dual 1-inch tweeters (arranged in two groups each containing one woofer and one tweeter placed on the opposite sides). Each speaker has 8Ω impedance and 88dB sensitivity. Speakers can handle continuous power input (RMS) of 20W and Peak power input is rated at 100W. Frequency response spans from 130Hz to 20kHz and crossover frequency is set at 4000Hz. AVBP2 speakers look really beautiful and can be combined with many other speakers but it’s probably best to match them with some Fluance floor standing (or bookshelf) speakers and one of Fluance subwoofers with the same black ash finish. Excellent build quality – MDF cabinet, strong protective cloth grille, neodymium tweeters and polymer-treated woofers. The installation process is simple. Speakers are wall-mountable. They have 5-way binding posts. These Fluance speakers offer excellent performance. Lows, mid, and highs are perfectly balanced across a wide range of frequencies (200Hz to 20kHz). Mids are rich and detailed, highs are sparkling. Low-end reproduction is poor but that’s not the main purpose of surround speakers. Perfect surround sound at an affordable price – that’s the best description of these Fluance speakers. There is probably no better value for your money when it comes to surround speakers. We could complain about the mid-bass and bass reproduction or about their loudness (they could be a bit louder) but for the price, these are great. If you are looking for the ultimate 3D surround sound experience there is no better way than buying 1, 2, or even 4 height speakers. We have decided to present to you Yamaha’s NS-IC400WH in-ceiling speakers. You can buy a bundle of two (about $150), four (about $400), or six speakers (six is too much for one room). The speakers are available in 4 versions (90W/110W/120W/140W). We are presenting to you 140W version. Each speaker comes with a grille and a cutout template (if you buy a bundle, there will be only one template). The grille is easily removable (magnetic attachments) and you can paint it so it won’t stand out if your walls/ceiling are not white. The speaker has 10.9 inches diameter, it’s 4.25-inch deep and it weighs 4.2 pounds. Inside each speaker, there are two coaxial drivers – one 8-inch polypropylene woofer and one 1-inch tweeter. Speaker’s impedance is 8Ω and sensitivity is 90dB. It can handle 50W of continuous power input (RMS) while the peak power input is 140W. Frequency response spans from 50Hz to 28kHz and crossover is set at 3.5kHz. Nice and simple design. Removable and paintable grille. Easy and quick installation process (grille with magnetic attachments, the speaker has large clamps for attaching to the ceiling). If you haven’t done this before, you should probably call a specialist and avoid ruining your ceiling. Pretty good sound quality, rich and detailed mids, pretty good low-end reproduction. Highs lack some clarity. They are a bit harsh at high volumes. If drilling holes and installing in-ceiling speakers is too complicated and/or too expensive for you, you can always buy elevation speakers that simulate the 3D sound and get a similar experience. We are presenting to you one of the best (and most expensive) elevation speakers – Klipsch RP-140SA. You can buy it for about $400 (this is the price for a pair). If you are looking for the best possible performance and have that kind of money, you can’t go wrong with this speaker. The speaker comes with a user manual and 5-year warranty card. Speaker cables, banana plugs, and mounting kit are not included. The speaker weighs 7.6 pounds, it’s 7 inches high, 6 inches wide, and 11.25 inches deep. Inside sturdy MDF cabinet, there are 2 drivers – one 4-inch woofer and one 1-inch tweeter. Speaker’s nominal impedance is 8Ω. It can handle 50W of power continuously (Peak power input is 200W). The crossover frequency is 2kHz. Recognizable Klipsch design – simple and stylish, completely black with a black magnetic grille. Excellent build quality – black MDF cabinet with brushed veneer finish, titanium tweeter, ceramic cone woofer. Simple installation – you can put it on top of your floor standing or bookshelf speaker (preferably made by Klipsch) or you can mount it on the wall. You can also use them as surround speakers. 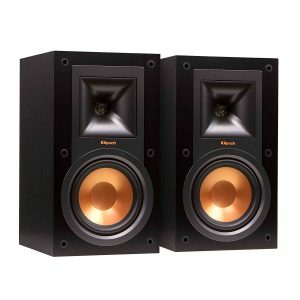 Like most of the Klipsch speakers, RP-140SA speaker sounds pretty good. Mids and highs are nicely balanced and rich but we are not really sure about the height effect. The sound should reflect off the ceiling and simulate height effect but it’s not as good as the real thing. Not as good as ceiling speakers – it’s maybe smarter to use these as surround speakers. 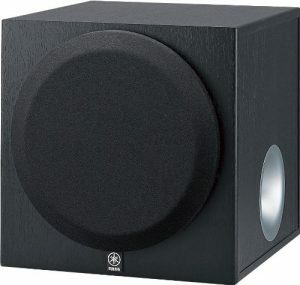 RP-140SA is an expensive pair of speakers. This is the end of our list of 27 best home theater speakers but not the end of our article. We have prepared for you some more reading material. If you want to know more about different speaker layouts, roles of each individual speaker in a home theater speaker system, different types of speakers that can be used, and if you want to get a better understanding of all those technical characteristics, you should keep reading. First, we are going to go through some of the most common speaker layouts. The layout you are going to choose depends mostly on the size of your room but also on your budget. If you have a small or medium room, you will be perfectly fine with 5.1 system but if you want more spacious sound you can always go for 7.1 system or even 9.1. Of course, you are going to need a bigger room for that kind of surround sound experience. Also, 5.1 systems are the cheapest ones and they are usually easy to install (unless you want to install your surround speakers in your walls). 5.1 is the most common layout. It includes six speakers – Center, Front Left, Front Right, Surround Left, Surround Right, and a subwoofer (SUB). The speakers have to be positioned appropriately. You can see typical 5.1 speaker layout in the picture below. Decent entry-level 5.1 speaker system may cost $100-$200 but if you want better sound quality and more immersive listening experience you will have to pay at least $500. The prices can go up to a couple thousand. It all depends on your budget. Installing 5.1 system is relatively easy. Wiring your surround speakers is the trickiest thing, not because it’s physically exhausting but because you have to find a way to hide the cables. Having in-wall surround speakers is a great solution (it’s the best in terms of aesthetics) but it will cost you a lot of money and time. Making holes in your walls and wiring surround sound speakers will be even more difficult if you choose this option. The result will be more than satisfying but the real question is do you have enough money, time, and nerve for that kind of project. For most of the rooms, high-end 5.1 system is more than enough for an incredibly immersive experience. All of today’s Blu-Ray and DVD disks have at least one 5.1 audio track (DTS 5.1 or Dolby Digital 5.1) and 5.1 speaker system is the thing you need to get the most of these movies. Having 5.1 speaker system instead of small TV speakers gives you a completely different experience, it’s almost like watching a different movie. And that’s not an overstatement. The transition from TV speakers to 5.1 speaker system is going to make a huge difference. Most of the speaker systems on our list of 27 Best Home Theater Speakers are 5.1 and most of the speaker systems on the market are 5.1. If you want even more spacious surround sound, you can always go for 7.1 system. 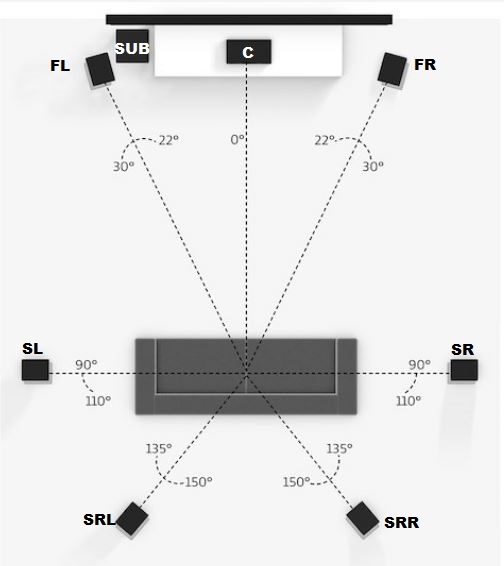 Besides those speakers in 5.1 system (C, FL, FR, SL, SR, and SUB), 7.1 system has two additional speakers that should be placed behind you – Surround Rear Left and Surround Rear Right (SRL and SRR). You can see a typical 7.1 layout in the picture below. In order to add two additional rear speakers to your home theater speaker system you will need some space behind your sofa or couch and you will need an appropriate AV receiver (the one with at least 7 output channels for speakers and one or two outputs for subwoofer or subwoofers). Just like surround speakers, rear speakers can be built into walls which is visually pleasing but also very expensive and time-consuming solution. You can also mount them on walls (much cheaper and aesthetically pleasing solution). Most of those modern AV receivers have two outputs (or pre-outs) for subwoofers so you can have not one but two subwoofers (one next to the front wall and the other behind you, next to your rear wall or one on the left and the other on right side of the room). There are a few reasons for adding an extra subwoofer to your system but the most important is to even out the sound coming from the subwoofer. If you have a big room, bass might not sound the same in each area of your room and depending on your viewing position your listening experience will be different. In order to spread the bass evenly across your room you have to add another subwoofer and place it on the opposite side of the room. If you have a small room, you will be just fine with one subwoofer (preferably 12-inch sub). With the introduction of object-based surround sound audio tracks, height speakers appeared. The idea of having the third sound dimension is very tempting. In order to play and listen to object-based audio tracks (Dolby Atmos and DTS:X), you will need height speakers (elevation or in-ceiling). You can add 1, 2, or 4 height speakers to your home theater speaker system and place yourself in the middle of the action (quite literally). You will hear airplanes and helicopters flying over your head, bullets flying around you, you will hear someone sneaking up behind your back and all the other sounds coming from all three dimensions. Height speakers are usually not too expensive but they are not easy to install (especially in-ceiling speakers). The installation might cost you even more than the speakers. 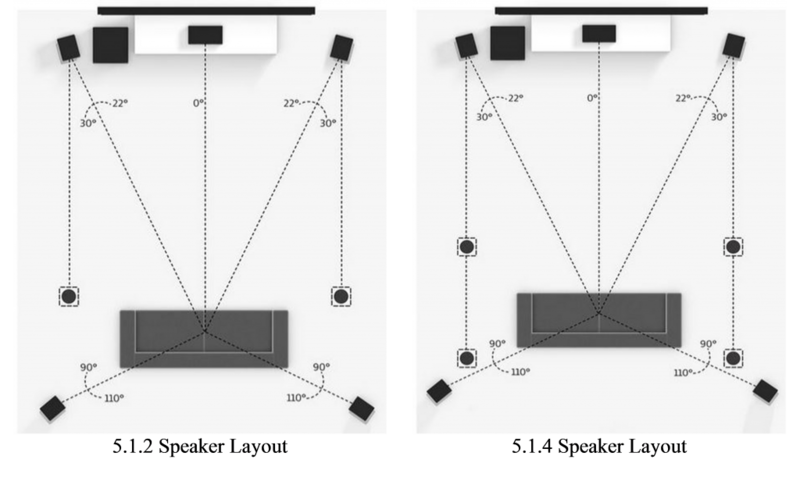 You can see the most common speaker layouts with 2 and 4 height speakers in the pictures below. 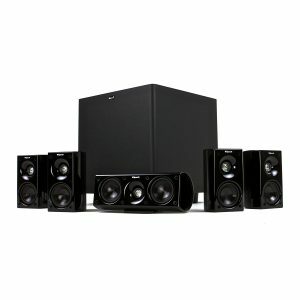 As you already know, there are at least 6 speakers in a home theater system (C, FL, FR, SL, SR, and SUB). Bigger speaker systems have additional speakers (SRL and SRL, as well as height speakers). Each of these components of a system has its own function and different characteristics. In this section, we are going to talk about all these different speakers and try to explain what each of them does in a home theater speaker system. Center channel is, along with FL and FR speakers, a critical part of a home theater speaker system. It reproduces most of the dialogues in a movie or a TV show and if you want to hear everything loud and clear, you need a really good center speaker. Ideally, it should have wide and flat frequency response. If you decide to buy each speaker separately, you shouldn’t make compromises when it comes to the center speaker. Center speaker is usually wider (in order to make wide soundstage) and thinner than the other speakers. Thanks to its thinness, you can place it easily under your TV and avoid blocking the screen. Center channel is also in charge of reproducing music and some sound effects, which implies once again that it has to be a speaker with wide frequency response. Front speakers are in charge of reproducing music, but they are also used for some special effects and some dialogues (especially when a person is moving from left to right (and vice versa) while talking). If you are going to use your system for listening to music, your Front Left and Front Right speakers will act as left and right stereo channels. That’s why it’s really important to have good FL and FR speakers. 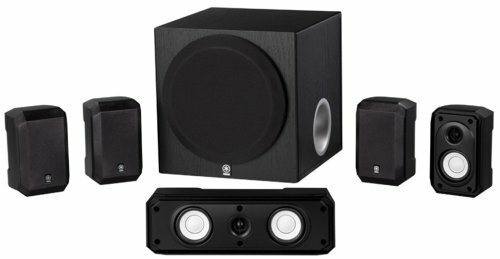 Just like the center speaker, these are critical parts of a home theater system and they should have a wide frequency response with punchy bass (it doesn’t have to be extremely low since you have a subwoofer, too), clear and detailed mids and highs. If you decide to buy a set of speakers, then you don’t get to choose a specific type of speaker for your FL and FR. That doesn’t have to mean that those are bad. There are even some entry-level models that sound pretty good. If you want to buy each speaker separately, you should know that there are a few possible options – you can choose between bookshelf speakers, floor standing speakers, and regular satellite speakers. It’s probably a good idea to stick to one brand (preferably the same line of speakers) when it comes to center and front speakers. If they are made by the same manufacturer, there’s a greater chance they will work well together. And they will also look good (especially if there are from the same line). Let’s now discuss different types of speakers that you can use as FL and FR channels. The next three sections can be useful to those that want to make their own custom home theater system and to those that want to replace their front speakers with something better and stronger. Bookshelf speakers are mid-sized speakers (smaller than floor standing speakers and larger than satellites). They can usually fit your bookshelf (hence the name). You can also place them on floor stands next to your TV. For a good bookshelf speaker, you would have to pay at least $100. They should have wide frequency response and good bass response. Because of that bass response, they will work nicely with a subwoofer and there will be no gap in frequency response. Floor standing (or tower) speakers are the largest of the three types. They are designed for music reproduction. They have very wide frequency response and some high-end floor standing speakers can even reproduce those really low frequencies. Some tower speakers can be used even without the subwoofer but if you want the best possible surround sound experience, you should never give up on the subwoofer even if you have high-quality towers. Satellite speakers are the smallest of these three types. They are not the best option when it comes to front speakers and they are not as good as the previous two types (not so wide frequency response – mids and highs might sound good but their bass response is simply poor). Some low-end home theater speaker sets come with 4 identic satellite speakers (two front speakers and two surround speakers) but to be honest, satellites can be used as surround speakers but if you want perfection you need something stronger and bigger for your FL and FR channels. Mid-end and high-end speaker systems usually come with 2 larger bookshelf speakers (FL and FR) and two or four smaller satellite speakers (surround speakers). You can use bookshelf and floor standing speakers as your surround speakers but there are two reasons why you shouldn’t. First of all, bookshelf and floor standing speakers have much better frequency response and can reproduce lower frequencies better than the satellites but surround audio mixes don’t really include that much bass and you would be wasting your money on much better speakers than you really need. The second reason is the space. Bookshelf and floor standing speakers take much more space than satellites and if you don’t want something standing in your way all the time, you should go with inconspicuous satellite speakers. If you don’t mind spending more money than you have to and if you have enough space, then you should buy bookshelf or floor standing speakers. Most of the people will be just fine with satellite speakers. They are small, they don’t stand in your way and you won’t have to change furniture arrangement to make some space for the speakers. The subwoofer is usually the biggest and heaviest speaker in a home theater speaker system. It’s in charge of reproducing really low frequencies (usually up to 200Hz). Subwoofers have much larger drivers than the front and surround speakers. Their diameter spans from 6 inches to 15 inches (there are even some larger subwoofers). 6 or 8-inch subwoofer may be ok for a small room but if you really want to fill the room with bass and make your walls shaking you need at least 12-inch subwoofer. You will need even larger subwoofers for big rooms. Most of today’s subwoofers are usually active (powered) which means that they have built-in amplifiers and they receive an audio signal from the AV receiver. Passive subwoofers need an external amplifier or, in some cases, they can be powered by the receiver. Still, connecting and powering passive subwoofer can be a tricky thing and you should probably stick with powered subwoofers. The subwoofer can be sealed or ported. Subwoofers with a sealed enclosure are usually smaller and they can’t really reproduce really strong bass. Ported subwoofers are much larger and heavier. They have large holes called bass reflex ports designed to improve bass response and they can actually produce more punch and much stronger bass. Unless you have really small room, you should probably go for a ported subwoofer. There is one more important thing about the subwoofers and that’s driver placement. There are basically three types of subwoofers – down-firing, side-firing, and front firing. To be honest, there is no too much difference between these three types. The only thing we should probably mention is that down-firing subwoofers may produce different sound depending on the surface they are placed on. Also, you should avoid placing down-firing subwoofer on some surface that vibrates a lot. The sound coming from the subwoofer will be different depending on the position in your room. You should try to move it around a little bit and see what kind of sound you prefer (closer or further from the wall, in front of you or behind you; some people even like to put the subwoofer under the couch). If you want to experience three-dimensional sound, you can add height speakers to your home theater speaker system. Thanks to object-based soundtracks (Dolby Atmos and DTS:X) that you can find on some Blu-ray discs, you can now experience the sound in three dimensions. You can hear a helicopter flying over your head, for example. There are two options when it comes to adding height speakers – you can buy elevation speakers (or Dolby Atmos-enabled speakers) or you can buy in-ceiling speakers. Elevation speakers are slightly cheaper and hustle-free option. Installing these speakers is much easier than installing real in-ceiling speakers. Elevation speakers are actually up-firing speakers that you can place on a floor stand or next to your TV. The sound coming from these speakers is directed towards the ceiling, it reflects off it and then comes to your ears. That way, they create the illusion that something is happening above your head. 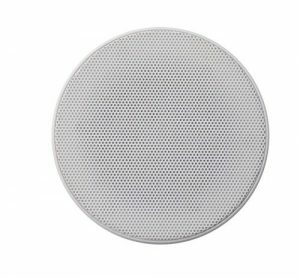 In-ceiling speakers are much more expensive option but not because of the price of the speakers themselves – it’s because of the installation process. Drilling holes, wiring the system, and positioning the speakers – all these things make the installation really difficult and expensive. Still, having in-ceiling speakers as height speakers is a better option than having elevation speakers. In-ceiling speakers make the sound more real than elevation speaker (they only simulate the third sound dimension). 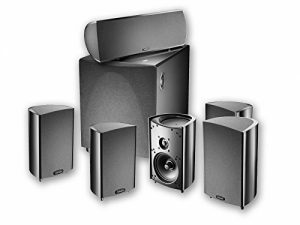 Now that you know all the important things about different types of speakers in a home theater speaker system and about different speaker layouts, there are only two more things to discuss –price (your budget) and technical specifications. Defining your budget is probably the first thing you should do. There is a vast number of different speakers and speaker systems on the market and their prices vary a lot. You can buy a decent entry-level home theater speaker system for less than $200 and that’s probably the minimum you should spend on a 5.1 speaker system. There are even cheaper systems and you can find some of those on our list of 27 Best Home Theater Speakers, too. But, you have to be aware that with certain price comes certain quality. Those really cheap speakers and speaker systems on the list are good for the price and nothing more than that. They cannot compete with more expensive mid-end and high-end systems. 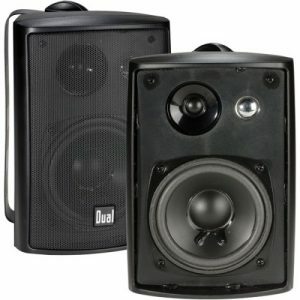 Some mid-end individual speakers can be bought for less than $100. There are even cheaper subwoofers, bookshelf speakers, and satellite speakers but if you want something that’s going to sound good and last long, you should spend no less than $100 on each speaker. Very good mid-end speaker system can be found for $500-$1000 and if you want even more, you should be prepared to pay a few thousands of dollars (or even tens of thousands). To be honest, we don’t really see the reason why you would spend tens of thousands of dollars on a speaker system unless you are making your own cinema but it’s all up to you and your budget. When it comes to individual speakers, you can make an amazing speaker system for $200 per speaker (about $1000 for 5.1 system) and you probably don’t need to spend more than $1000 – those speakers will be perfect for a mid-sized room and pretty good for a large room. Again, if you want even louder, more immersive, and more spacious sound, you can always buy bigger speakers or add more speakers to the system (rear speakers, height speakers) and spend more money. Again, it’s all up to your preferences and your budget. Wireless speakers and speaker systems are a special group of speakers. They are usually more expensive than regular wired speakers not because they can deliver better sound but only because they offer cable-free environment (it’s important to notice that none of these wireless speaker systems are completely wireless – they only eliminate some cables). You can’t really find a good wireless speaker system under $500. Our favorites are SONOS 5.1 system and Enclave Audio 5.1 and they both cost a lot (SONOS system costs more than $1.500 and Enclave Audio 5.1 costs about $1.000) but even those expensive wireless speaker systems are not better than some wired mid-end speaker systems that you can buy for $800-$1000. Technical specifications can be really tricky stuff. Most of the manufacturers try to emphasize the most important technical characteristics but if you don’t understand what each of these (or at least the most important ones) characteristics represents, they will be just a bunch of random numbers to you. So, in order to get the basic idea on what different technical specifications mean, let’s go through some of the most important ones that you can find on most specification lists. Power ratings represent the amount of power that certain speaker can handle. 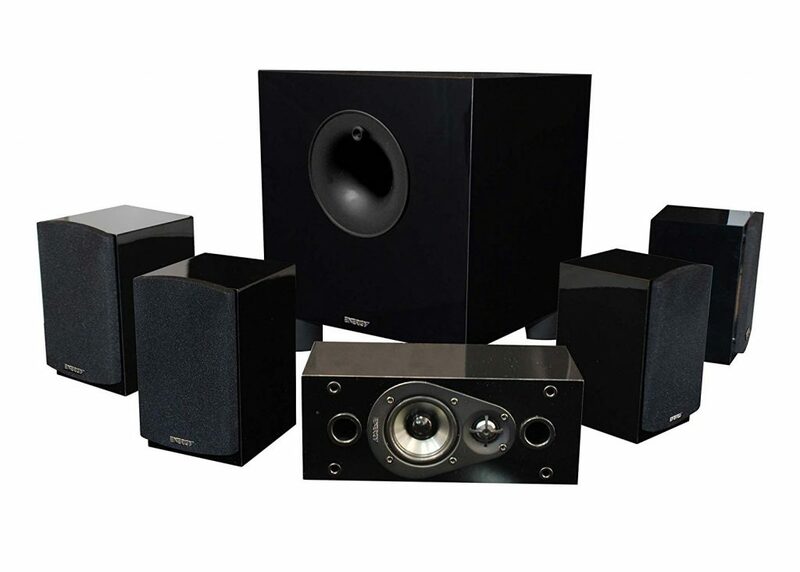 Most of the speakers (active subwoofers are an exception) in a home theater speaker system receive the power from the AV receiver and you should try to match the output power of a built-in amplifier or AV receiver (it’s usually given as output power per channel for certain impedance – 4, 6, or 8 Ohms). You should understand the difference between RMS and peak power ratings. RMS represents the power that certain speaker can handle during long periods of time while the peak value represents the maximum power that certain speaker can handle for a really short period of time (less than a second). Speaker manufacturers often advertise the peak power rating as speaker’s power rating and they somehow forget to mention the RMS power rating. You should know that a speaker with a peak value of 500W usually have RMS rating lower than 250W. When comparing the power that some speaker can handle with the output power per channel of your AV receiver you should always compare speaker’s RMS values with receiver’s RMS values and speaker’s peak values with receiver’s peak values. There is no point in comparing RMS values of a speaker with peak values of your receiver (or vice versa). This is not the only thing you should pay attention to when matching speakers with your receiver. Receiver’s power ratings are given for a certain impedance (load) and those power ratings are different for 4, 6, or 8 Ohms and that’s why you should always pay attention to the speaker’s impedance (more on that later). If there is only one power rating number in a specifications list, you should assume that this is the peak value. That way, you will always be on a safe side. Some speaker manufacturers even specify the output power of an amplifier (suggested power range of an amplifier or suggested amplification) which makes things much easier – you just have to check what’s your receiver’s/amplifier’s output power (RMS or Peak) for a load that matches your speaker’s impedance and determine if it can drive that specific speaker. Sensitivity and efficiency are similar but not the same things but they are often confused and even some manufacturers don’t really make the difference between sensitivity and efficiency. Efficiency tells you how efficient a certain speaker is at converting power to sound. It’s measured with a microphone and the unit of measurement is dB of sound pressure level per 1W. Some manufacturers may call it sensitivity or SPL and it’s usually given in decibels. This number shows you how effective and how loud some speaker can be. Any speaker with sensitivity greater than 90dB can be considered very good. We can hear any sound within the frequency range 20Hz to 20KHz. This range gets shorter as we are getting older. Speakers are designed to reproduce a certain range of frequencies. Ideally, they should be able to reproduce all the frequencies from our hearing range but that’s usually not the case. That’s why we have different types of speakers and that’s why we use speaker systems. In a system, a subwoofer is in charge of reproducing really low frequencies (starting from 20Hz) while the other speakers reproduce low-mid, high-mid, and high frequencies. Some bookshelf and floor standing speakers can reproduce really low frequencies like mid and upper bass (down to 60Hz). Having flat frequency response (equally good reproduction of all the frequencies) is the ideal of every speaker and every manufacturer but not all people like flat frequency response. Some people prefer ‘’bassy’’ sound, others prefer warmer sound without too much bass, so it’s not really all black and white. Impedance tells you how hard it is to drive the speakers. Speakers used in home theater systems usually have 4, 6, or 8 Ohms impedance and they can be powered by many AV receivers but you should still be careful. Receivers don’t really have their own impedance but they are designed to drive the speakers with a certain impedance. If a receiver is designed to drive 6 or 8-Ohm speakers and you connect 4-Ohms speakers, the speakers will work, but the receiver will be in danger of overheating. That’s why it’s really important to check if the receiver can drive your speakers. Some receiver manufacturers specify the range of impedances that tells you what kind of speakers can be driven by the receiver (for example 4-16Ω). If there is no info on impedance range, you should check the power ratings of your receiver and it will tell you the same thing. If the receiver can driver 4, 6, and 8Ω speakers, you will find three different power ratings (one for each speaker impedance). Drivers placed inside the speakers are made of different materials and they are different in size. These two things are usually specified in the specification list. Cheaper speakers have drivers made of paper but if you want better quality you should buy a speaker with aluminum, carbon fiber, or polypropylene drivers. Drivers are also different in size. Smaller drivers (1-inch drivers and smaller) are called tweeters and they reproduce high frequencies. Woofers are larger drivers and they produce low and mid frequencies. There are also full-range speakers (smaller than woofers and larger than tweeters). They can reproduce some low and some high frequencies, but they are the best at reproducing mid frequencies. 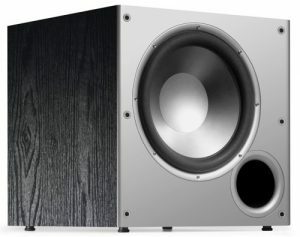 Some speakers (especially bookshelf and floor standing speakers) have multiple full-range speakers, woofers, and tweeters and can reproduce wide range of frequencies including low frequencies (down to 60Hz) but they can’t reproduce sub-bass frequencies (20Hz to 60Hz) and that’s why you need to combine them with one or two subwoofers to get the best possible sound. The sound quality is a highly subjective criterion. All those specifications (power ratings, impedance, frequency response, type, size, and number of drivers, sensitivity) can give you the basic idea about the speaker (or a speaker system) and they can tell you how precise, loud, and durable they are but none of those characteristics is going to tell you whether you are going to like the sound or not. The best thing you can do is to test them and hear them. If you don’t have the opportunity, you will have to rely on our reviews and on the experience and impressions of other customers. Most of those expensive speakers and speaker systems deliver very good sound but those low-end and mid-end speakers can be tricky – the market is flooded with cheap and affordable speakers and not all of them are good. You could find a surprisingly good speaker system and even save some money but you can also waste a significant amount of money on a system that’s simply awful. That’s why you need to do your research and not make a rash decision. Our reviews can be the starting point but you should also read other reviews (especially those written by the people who used the speakers for a long period of time). And again, if you have the opportunity, hear the speakers before buying them. When it comes to wireless speakers and speaker systems, finding the right one can be even more difficult. One thing you have to pay attention to is the connection quality. No matter how well they are made and how good the drivers inside the speakers are, without good connection quality, the wireless speaker system is useless. You should also be aware that some wireless home theater speaker system may cause interference with other equipment using the same Wi-Fi network and they could also slow down your internet connection. Some wireless home theater speaker systems and surround sound systems might not support all the surround sound audio formats and you have to pay attention to this issue, too. For example, SONOS home theater system doesn’t support any DTS audio format and that could be a deal breaker for some people. We have finally come the to end of our article on 27 best home theater speakers. Hopefully, you have a much better understanding of different parts of a home theater speaker system, different speaker layouts, roles of each individual speaker, and their characteristics. If you liked our article on 27 best home theater speakers, please share it and subscribe to our mailing list. PrevDo Headphones Increase Your Risk of Hearing Loss?